Advertisers who started using 2Performant platform after August 2016 (when we migrated 2Parale to 2Performant) might not know this detail, but the ones who were active in 2Parale, had the right to offer their affiliates preferential commissions based on their performance. More precisely, if an affiliate had remarkable results in a specific affiliate program, the advertiser who managed the program had the opportunity to reward his/her professionalism with a higher commission or a higher cookie lifetime. Because of various reasons, we couldn’t implement this feature in 2Performant from the start. But in the near future, in about 2 weeks to be more precise, this functionality will also be available in our new platform. In order to accommodate any type of commission (fixed percentage of the sale amount, variable percentage of the sale amount, fixed sale comission, fix lead or variable lead), we have changed the working pattern of the preferential fee. More specifically, advertisers will be able to offer their affiliates a higher sales commission by giving each affiliates a “multiplier“. For example, if an affiliate program has a standard 10% fixed comission, the advertisers can provide a 1.2x multiplier for a specific affiliate (or 20% increase), leading to a total of 12% commission for each sale generated by that affiliate. 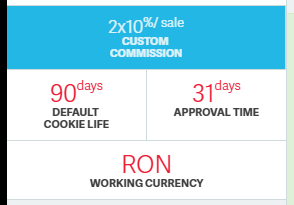 If another advertiser offers a flexible commission (lets say, depending on the category of the purchased product) then a 1.5x multiplier is given to the affiliate X, which serves as a 50% bonus compared to the standard commission offered to other affiliates. Why announce today this feature when it will only be available in 2 weeks? Because while preparing its launch, today, we changed the way custom conditions transferred from 2Parale, are displayed in the new platform. 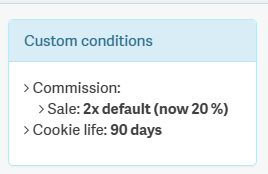 After launching this new feature, rather than the full value of the granted preferential comission (12% instead of 10%), we determined the corresponding multipliers that can be modified by the advertisers. Besides, for affiliates and advertisers that come from 2Parale and were accustomed to seeing something different in the platform, it is possible that the new display might raise some questions. As always, we’re looking forward to your comments on this subject and we promise that we’ll announce the possibility of changing the multipliers as soon as it becomes available. Excelent! Asteptam facilitatea aceasta de la migrarea din 2Parale.